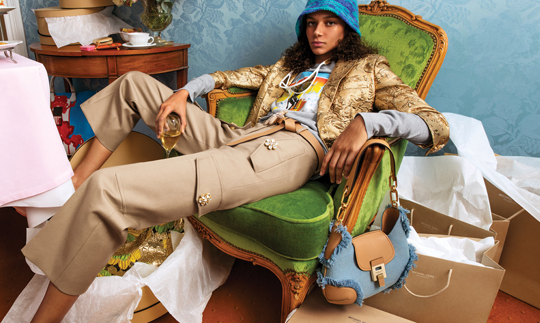 “I wanted the images to capture the ease, confidence, and irreverent attitude of today’s luxury travelers,” says Michael Kors of the spring 2019 Michael Kors Collection ad campaign, photographed by renowned Dutch photographers Inez van Lamsweerde and Vinoodh Matadin. Michael Kors Spring 2019 campaign portrays a modern interpretation of the brand’s jet set sensibility. The new campaign portrays a modern interpretation of the designer’s iconic jet set sensibility. Van Lamsweerde and Matadin capture model Binx Walton in the intimacy of her hotel suite at the storied Le Negresco in Nice, France. The hotel’s lavish and playful interiors underline the brand’s iconic mix of glamour and ease—the signature of today’s jet set. The clothes are a blend of the laid-back and the glamorous. Bright colors and bold patterns—from painterly florals to eclectic animal prints—mix with surf-inspired silhouettes, metallic brocades, and romantic broderie anglaise to create a wardrobe that works all around the world.